John Stockwell, Julia Brand and children, from left: Hilda, Harold and Louis. 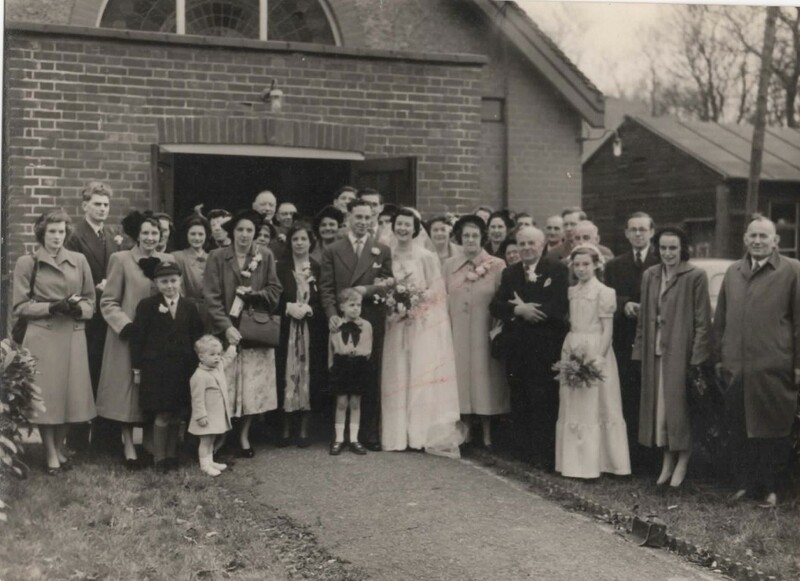 Wedding 1952 - John H Stockwell and Maureen Cooper, Thundersley Congregational Church. 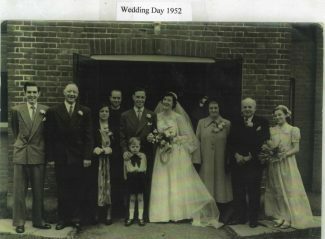 L to R: Roy Luxford, Harold Stockwell, Kathleen Stockwell, The Reverend, John Stockwell, Maureen Stockwell, Maud Cooper, Charlie Cooper and Jennifer Stockwell. Front: Michael Reed. Front row, first right: Jennifer Stockwell (my Aunt). Sweyne School, Rayleigh. Doug and Joan Acres wedding. Jennifer Stockwell forefront. Wedding of John and Maureen Stockwell. 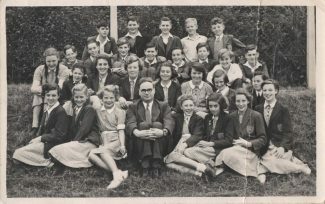 Group photo 1952. Nicholas Pankhurst Stockwell was born in Kent in about 1832. He married Ann Maria Foster in 1857 and they moved with their 8 children, who were born between 1859 and 1873, to South Benfleet from Sittingbourne, Kent in the late 1880’s. John Stockwell Married Julia Brand in 1902. Edward Married Laura Melinger in 1896. They had 2 children, Edward and Nellie. 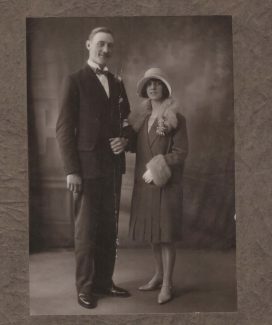 Esther Married George William Hackshaw in 1919. No children. In 1894 Nicholas P Stockwell was a Brick Manufactuer and employed his 5 sons. They worked the brick fields between Endway (now Essex Way) and Vicarage Hill. The eldest son John Stockwell also worked on farmland which is now Boyce Hill Golf Club. Nicholas died in 1916 aged 84 and within one month of his wife Ann Maria. They had been married for 59 years. 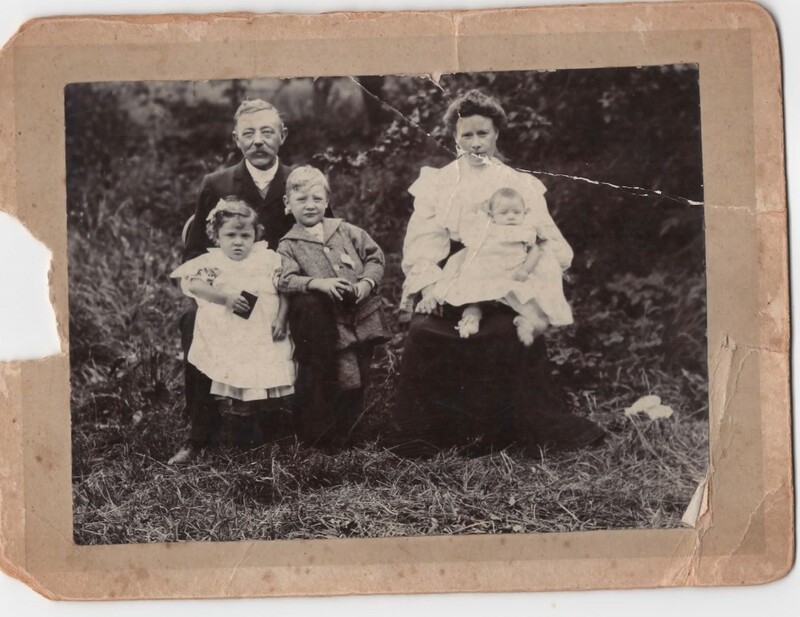 John and his wife Julia lived at 9 Endway and had 3 children; Harold, Hilda and Louis. Julia’s brother Charlie Brand married George Land’s daughter Laura in 1893. Charlie and Laura had 3 daughters Linda, Edna and Dora, who subsequently married into the Tuffield, Quilter and Hall families. Married Frederick Bailey and they had 2 sons Clive and Gerald. 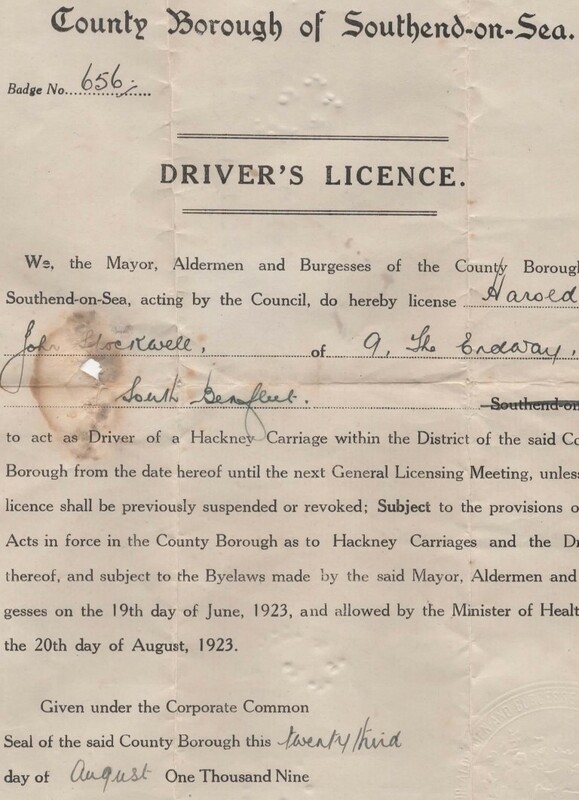 Harold was my grandfather and he married my grandmother Kathleen Kemp in 1928, at Rochford Registry Office. They lived in Kenneth Road, Thundersley for the whole of their married life. As a young man my grandfather worked on Boyce Hill farm. When he retired from Fords he worked as a caretaker at the Health Centre in Hart Road, Thundersley until his death in 1979. My grandparents had two children, John and Jennifer and John is my father. My aunt Jennifer lived in Benfleet until she married Dr Ranjit Bose in 1966. My father spent all his childhood and early adult life in the Benfleet area. In 1935 he went to Thundersley Primary School and later Beulah College in Rayleigh. 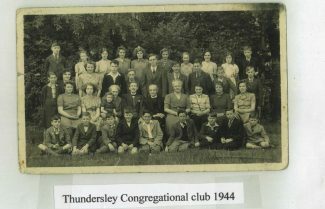 He was also an active member of the Thundersley Congregational Club. He married my mother Maureen Cooper, who lived in Thundersley Park Road, at Thundersley Congregational Church in 1952. Their first home between 1953 and 1955 was a houseboat on Benfleet Creek. My 2 sisters, Amanda and Beverly, were born in Benfleet and I was born later in Sussex in 1956 after my parents moved. 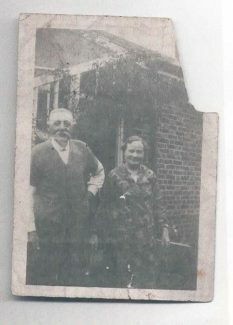 My father returned to Benfleet for the last 2 years of his life and passed away in 2011. My father was the last male Stockwell. 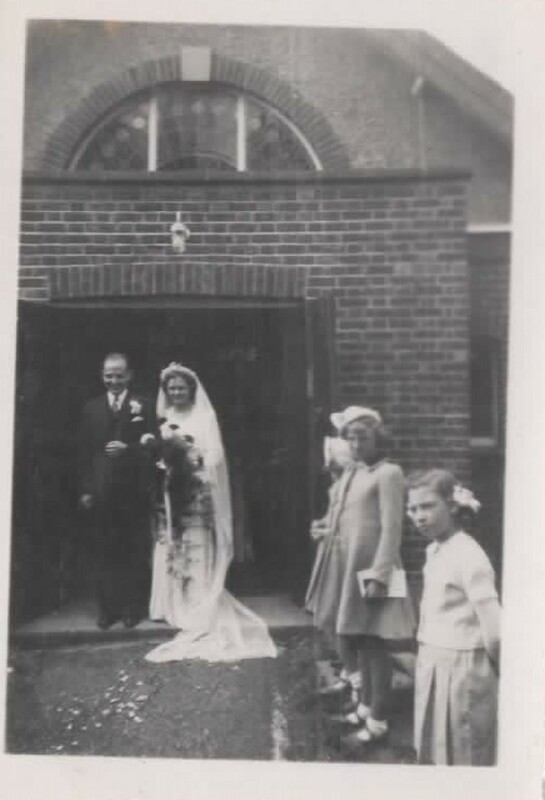 My parents, John and Maureen Stockwell, are interred in the grave of my grandparents, Harold and Kathleen, at St Peters Church Thundersley. All other members of the Stockwell family died in South Benfleet and are buried in the cemetery at St Marys Church South Benfleet. I was just surfing and remembered a famous soldier, with whom I was once confused as he had exactly my name as above. I doubt we have anything in common at all but I love the site, well done. 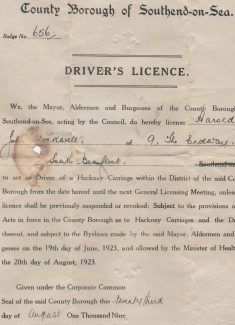 In fact my family in the 19th century lived in Leytonstone and my grandfather of the period was a headmaster at a junior school there. Cheers John. Yes please Peter, please add whatever you can to the site. Including anything about the Elizabethan Brickworks or even perhaps before those times? Err I am nephew, cousin etc. of the various Stockwell family and went to school with you too. Well done with the family history, its good to see the Brickmakers getting a mention, this industry was so important to South Benfleet after the collapse of farming in the Late Victorian period. I have made a comprehensive study of the subject. I’ll bring a paper copy with me on the 8th March if anyone is interested? Peter, thanks for adding your comment! Please do bring along your research to our display, we would be very pleased to see you there. Perhaps you would consider adding this work to our site, as you rightly say, so far this has not been covered on our pages and would make a worthy addition. We look forward to seeing you on the 8th. Thanks for the photos Trace, Graham and Tony are in the group one too. Brings back some memories eh? I’ll retire to my office for a weep now! What a great account of our family history, well done, and very proud of your great efforts. Let’s hope it is just the start and we can jog more peoples memories.